Lapsi (Atte ka Halwa without Ghee) is a popular and delicate sweet from Haryanvi cuisine. There are various ways to prepare lapsi. In some parts of of North India, people use broken wheat (Dalia) with jaggery. But in Haryana, people use wheat flour and jaggery or sugar to prepare Lapsi Halwa. 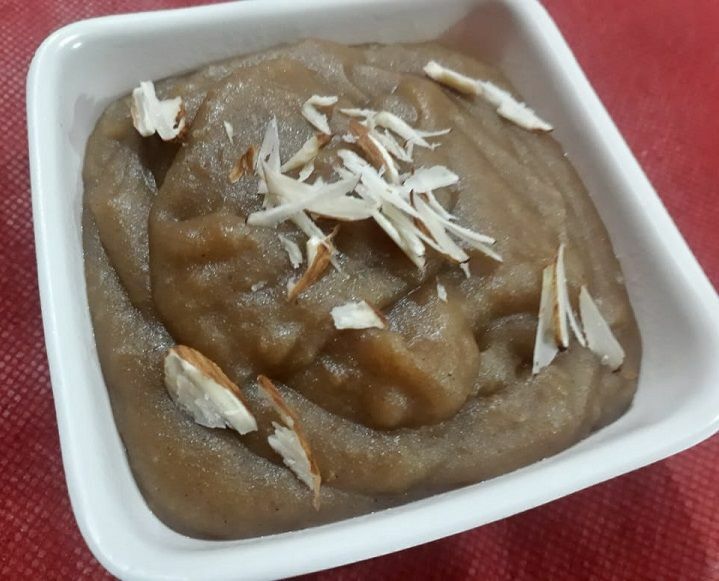 Lapsi (Atte ka Halwa without Ghee) is a tasty sweet dish made from wheat flour and sugar. It is a healthy halwa recipe as it is prepared without ghee. 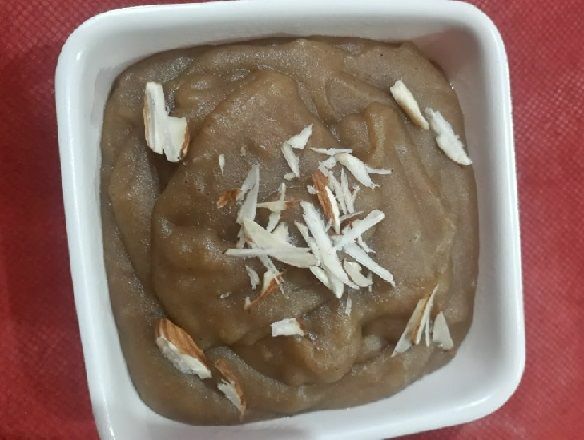 You can add jaggery in place of sugar to make this halwa healthier and more nutritious. This is very easy to make. Dry roast wheat flour in kadai on low heat stirring continuously till golden brown in colour. Slowly pour in water stiring continuously so that no lumps are formed. Once all the water has evaporated, add grated jaggery or sugar. Cook and stirring all the time till the mixture thickens. Add more water if required to get the desired consistency. Garnish with chopped almonds. Now Lapsi Halwa is ready to serve. Serve hot. If you liked this recipe, share it with your friends and family on social media. Your feedback matters, please add your suggestions or comments below.